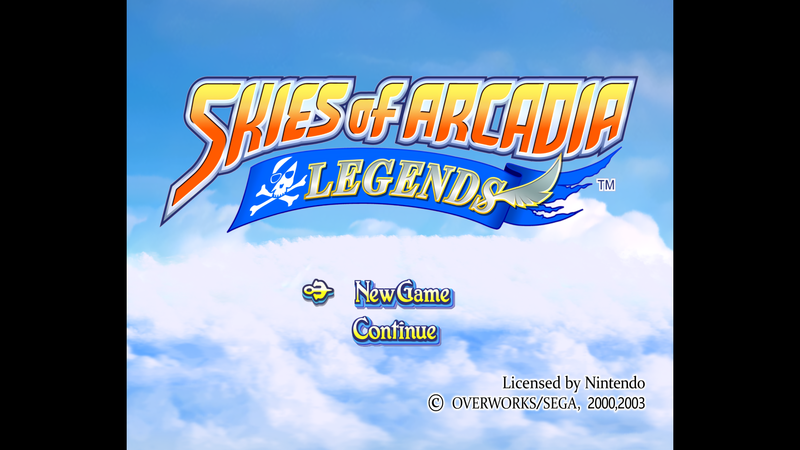 An HD texture pack for Skies of Arcadia by Bighead and frozenwings. This pack is still very early in development, so don't expect it to be anywhere near complete. At the moment much of the UI has been retextured and many textures have been created for the 3 main characters. There is no guarantee that this pack will ever reach completion, and updates will most likely happen at random intervals. This pack is meant to replace the original textures with HD versions, but in some instances may not be perfect replicas. There may be changes made where seen fit, or if we just don't feel like upholding the original look for whatever reason. For now you can view the ones I have on my Imgur album by clicking the image above. - A very important UI texture requires Store EFB Copies to Texture Only to be enabled in the graphics configuration. - Videos may be slow with both this texture pack + Store EFB Copies to Texture Only enabled. Either disable the option, or disable the texture pack until the video is done. - This is a tricky game to retexture the UI because of the way a lot of textures are tiled/stacked in-game and the way Dolphin handles scaling with different internal resolutions. - Some attempt was made to make sure everything looks as correct as it can be at 4x IR, but really all IRs should look okay enough. The main pack contains BC7 and uncompressed DDS texture and requires a DX11+ GPU. The compatibility pack will work with older GPUs but contains DXT1/DXT5 DDS textures which are lesser quality. Do not attempt to use this with the texture pack available above. This pack exists as an alternative. I am no longer offering a PNG pack, but the textures are archived here. These widescreen codes by gamemasterplc do not stretch the HUD and allow you to play with various aspect ratios beyond the standard 4:3 aspect ratio. These codes are for the USA version of the game. These codes are for the Europe version of the game. These AR widescreen codes enable 16:9 aspect ratio and stretch the HUD to fit the screen. These AR codes can affect the speed of the game. This is a collection of cheat codes. These have not been personally tested by me. - The pack now uses BC7 and uncompressed DDS textures. - Added new Gecko widescreen codes for NTSC version by gamemasterplc. - Added tons of Action Replay cheat codes for both the NTSC and PAL versions. - Added more missing texts. - Added 30 more Fina faces. - Added a few UI textures. - Added an "Optional" folder that will contain optional/widescreen textures. - Adjust standard flight depth meter, and add a widescreen version. - Fix "Focus" text and add "Run" text in PAL version. - Added a GameSettings folder that contains ini files with widescreen codes and forces EFB to Texture. - Added UI textures and a bunch of text that was missing in the PAL version. As usual - we're looking forward to any feedback, suggestions, and critiques. Enjoy what we have so far! I like this very much. Honestly, I didn't even consider playing this one because of terribly outdated graphics, but now this could be enjoyable. I have to think about it. Thank you for your hard work. OMG please wake me I must be dreaming. I been waiting for someone to retexture this game for the longest time. And to find out it was you Bighead that's a big plus. I know you told me before you tried working on this game with some other guy. But the way this game has multiple textures of the same thing made it impossible. Tell me has this issue been fix, or what? And if it's not and your still somehow managing to pull this through and work on the pack, that makes me really happy. And please don't give up on it, since its a hard game to retexture. It's an amazing JRPG of its kind, this game deserves a remake and that would never happen so a retexture is the nicest thing that could happen. If I knew how to make textures I would surely help. But I could however donate. All we need now is a hack to put the Dreamcast music into the GameCube version, and then there'll be no competition for the best version! (07-27-2016, 03:40 AM)Lumbeeslayer Wrote: I know you told me before you tried working on this game with some other guy. But the way this game has multiple textures of the same thing made it impossible. Tell me has this issue been fix, or what? It was somewhat fixed using EFB to Texture at some point, which was pointed out to me by phire here. Once I discovered that I immediately began working on a texture pack, since frozenwings and I have always had a desire to make one for this game but that issue stood in our way. EFB to Texture has some caveats as mentioned in the first post, and probably other things I don't know about yet, but it's the only way that the big texture that is responsible for the majority of the UI (e.g. this) will always remain retextured. With EFB to Texture there is only 2, maybe 3 versions of this texture that appear. With EFB to RAM, it captures a screenshot and places it over the texture making nearly infinite versions of it. (07-27-2016, 04:36 AM)The_Master_E Wrote: All we need now is a hack to put the Dreamcast music into the GameCube version, and then there'll be no competition for the best version! We've already looked into finding a way to do this, but it's not a simple task if it's even possible at all. Much of the audio on the gamecube disc appears to use a proprietary format that nothing in existence seems to handle. Some sounds like grunts and weapon clashes can be extracted and converted to other formats, but most of the music seems to be in a different format altogether. To expand upon Bighead's post, the "sound effects" and "music" files have different extensions. The sound effects are .dsp, which are convertible, and the music is .samp, which has no conversion as far as I know. If someone were to find a way to convert that to some non-proprietary format and from wav/mp3 back to .samp, we would definitely be all over that. (07-27-2016, 03:40 AM)Lumbeeslayer Wrote: OMG please wake me I must be dreaming. I been waiting for someone to retexture this game for the longest time. And to find out it was you Bighead that's a big plus. I know you told me before you tried working on this game with some other guy. But the way this game has multiple textures of the same thing made it impossible. Tell me has this issue been fix, or what? And if it's not and your still somehow managing to pull this through and work on the pack, that makes me really happy. And please don't give up on it, since its a hard game to retexture. It's an amazing JRPG of its kind, this game deserves a remake and that would never happen so a retexture is the nicest thing that could happen. If I was good at making textures I would surely help. But I could however donate. The other guy was/is me. I've been wanting to do this game for a long time now, really glad we're finally able to work on it. (07-27-2016, 07:35 AM)frozenwings Wrote: To expand upon Bighead's post, the "sound effects" and "music" files have different extensions. The sound effects are .dsp, which are convertible, and the music is .samp, which has no conversion as far as I know. If someone were to find a way to convert that to some non-proprietary format and from wav/mp3 back to .samp, we would definitely be all over that. Well thank you so much Frozenwings along with "Bighead" for working on a texture pack for an amazing JRPG of its kind. And if your reading this "Phire" thank you for fixing the bug with the textures. Yall guys are too awesome. Oh wow, glad to see that this game is getting re-textured, this is one of the best RPG that I have played, the characters are very likable and full of personality, the story is pretty damn good and the soundtrack is pretty awesome as well. Too bad the music for the gamecube version is pretty bad compared to the music of the dreamcast version. I just wish they made the gamecube version with 2 disc instead of 1, this way they could leave the music intact instead of lowering the quality of the music to fit the whole game in 1 disc. (07-27-2016, 12:33 PM)Resus Wrote: Oh wow, glad to see that this game is getting re-textured, this is one of the best RPG that I have played, the characters are very likable and full of personality, the story is pretty damn good and the soundtrack is pretty awesome as well. Maybe someday someone will figure out how to covert the audio files from .samp to .wav, or at least something more manageable.